As more Vermonters seek sustainable homes, who makes the rules, and certifies the results? At first glance, the house at 133 New South Farm in Hinesburg doesn’t look different from other ones in the area. Modestly sized and attractive, it’s perched on a south-facing hillside with an impressive view of the rural valley below. But this two-story dwelling, like its five neighbors, is arguably one of the “greenest” homes in Vermont. It doesn’t just does power itself; it earns its owner money. Chuck Reiss, owner of Reiss Building and Renovation, who constructed the six houses in the South Farm development, explains how. The dwelling’s conventional-looking metal roof is actually a photovoltaic array that generates 4700 kilowatt-hours of electricity, more power than the household needs. Excess electricity is fed back to the grid, where Green Mountain Power buys it for 19 cents per kilowatt-hour, a price set higher than market value to encourage homeowners to invest in renewable energy systems. Building any new house involves hundreds, if not thousands, of small but important decisions, involving everything from location to design to materials. (See Ryan and Susan Hayes’ chronicle of green home building, “Clean Construction,” on page 28a of this issue.) What sets Reiss’ house apart is that nearly all those decisions followed the guidelines of“Vermont Builds Greener,” a statewide green certification program developed by the group Building for Social Responsibility (BSR). 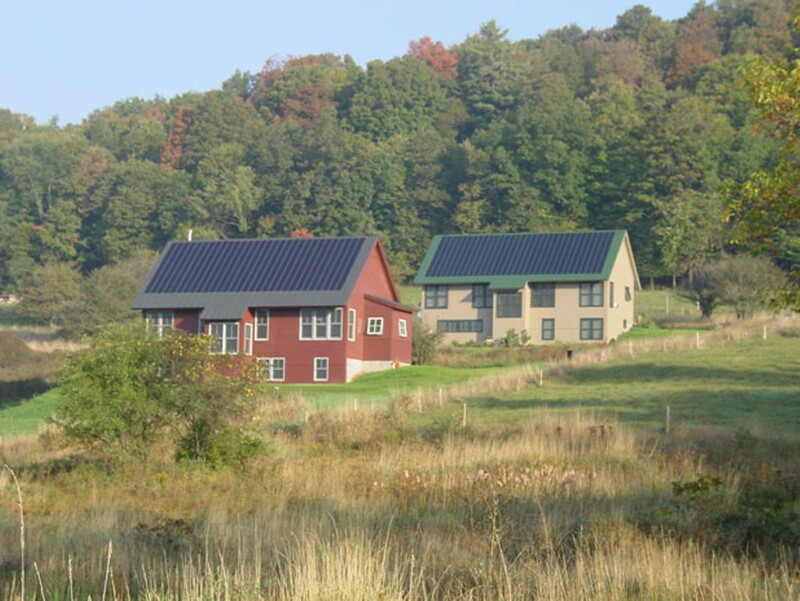 Vermont is on the cusp of a green-building revolution. With energy prices rising and public awareness growing about the dire consequences of global warming, more Vermonters are recognizing the long-term benefits — to the planet and their own wallets — of building sustainably. Earlier this spring, the legislature passed The Vermont Energy Act of 2009, an ambitious bill that offers significant incentives for investing in energy efficiency and renewable power. Reiss believes that move could push Vermont’s green housing market to the tipping point where it’s more affordable to build green than not. Admittedly, at a list price of $470,000, the house in South Farm may not seem to be within reach of most Vermonters. But Reiss, a guru in Vermont’s green-building community, bristles at the suggestion that it’s unaffordable. LEED — or Leadership in Energy and Environmental Design — is probably the most recognized name in green-building standards. Several buildings in Burlington, including the ECHO Center for Lake Champlain and the University of Vermont’s Davis Center, are LEED-certified and feature state-of-the-art energy systems and conservation technologies. LEED criteria can be applied to all types of buildings and emphasize eco-friendly strategies in five areas: sustainable site development, water savings, energy efficiency, materials and resources selection, and indoor environmental quality. Depending on the builder’s level of commitment, a building can be certified as silver, gold or platinum. In November 2007, the USGBC launched LEED for Homes, creating a nationwide standard for green home construction. But around the country, there are dozens of other regional programs that certify single-family dwellings as environmentally friendly. Each one has its own tiers, rating system, certifying body, and inspection requirements. Some have third-party verification systems; others don’t. In some states, the competition among such programs is fierce, and the fees to certify can vary by hundreds, even thousands, of dollars. Moreover, some groups seem to believe that if their green seal of approval becomes accepted as the industry standard, they’ll be rolling in the green themselves. Earning BSR’s Vermont Builds Greener seal of approval wasn’t easy, Reiss explains, as it requires scoring at least 100 points on about 80 different criteria in the design-and-build process. For example, a house cannot be sited on wetlands, prime farmland or sensitive wildlife habitat, or in the 100-year flood plain. All appliances, windows, doors and insulation must be energy efficient. All construction materials must come from nontoxic or sustainable sources, such as locally quarried stone and responsibly cut lumber. And significant measures must be taken to minimize construction waste and keep long-term maintenance costs low. Ironically, Reiss’ ultra-efficient homes in Hinesburg, two of which won Efficiency Vermont’s “Best of the Best Award” in 2007 and 2008, didn’t qualify for LEED certification. Why not? The plumbing fixtures don’t meet LEED’s requirements for water conservation. Reiss, who readily admits his personal bias for Vermont Builds Greener, says that’s just one example of how regional differences should be factored into the green-certification process. Water conservation is a critical need in other areas of the country, but in Vermont, he argues, where water is plentiful, other factors should have greater weight. For example, in northern climates, it’s more important to maintain a home’s “tight envelope” for more efficient heating, Reiss says. Likewise, VBG puts special emphasis on building smaller homes and protecting vital farmland from development, something other certifications don’t necessarily do. Not everyone agrees. Some in the industry argue that, rather than holding everyone to orthodox environmental standards few builders are ready to adopt, we should encourage them all to become incrementally greener, raising the bar slowly as eco-friendly products and building practices become more accepted industry-wide. After all, this contingent points out, who generates more bang for the buck — the custom-home builder who erects two LEED-Platinum houses each year, or the developer who builds 10,000 homes per year using a few basic green-building practices? Ward Smyth, owner of Turtle Creek Builders in Waitsfield, is a proponent of the philosophy that “a rising tide floats all boats.” As vice president of the Vermont Home Builders and Remodelers Association, the state’s largest homebuilders’ trade group, Smyth acknowledges that the National Association of Home Builders’ National Green Building Standard isn’t as rigorous as either LEED for Homes or Vermont Builds Greener. Nonetheless, with more than 700 members in his association, Smyth believes the National Green Building Standard can be an effective tool for spreading the gospel about green-building practices to even the state’s most conservative “Joe the Builder” types. Kate Stephenson is executive director of the Yestermorrow Design/Build School in Warren, which incorporates sustainable building and design practices into virtually every aspect of its curriculum. As a volunteer advocate for the LEED for Homes program, Stephenson recognizes that the growing number of green certifications can get a bit mind-boggling for consumers. How do Vermont consumers compare green apples to green oranges? Fortunately, five organizations recognized that it makes more sense for them to cooperate than compete. Together they launched the Vermont Green Home Alliance website, which presents an unbiased approach to educating the public about the various certification programs available in Vermont. The site is a treasure trove of information on green home construction, including each program’s check-lists, scoring systems, third-party verifications, fees and so forth. The goal isn’t to promote one program over another but to educate individuals about what’s right for them. Peter Schneider, senior project manager of residential energy services for Efficiency Vermont, strongly advises anyone who’s planning to build a green house to contact his organization first. His program, which is free to all Vermont ratepayers, offers free guidelines, incentives and technical support, such as integrated design reviews for green home builders. Of course, not everyone wants to go through a green certification process. While the extra hassle yields certain benefits, such as tax incentives and perhaps a bump in the resale value of the house, the decision has to suit the consumers’ needs.